Somewhere in the distance, lies a hidden water, deeply covered by nature. No one around, just you and the fish. Untouched waters, or heavy fished places. It doesn’t matter. The float tube way of fishing is one of a kind. There is no in between, it’s just you, the water and the fish. Three perfect ingredients for a ”Silent Approach”. During the Summer period, I have been out on the water afloat numerous times. In fact, my boat fishing got kinda behind. I needed a break from all the hectic moments on the water, in order to find true stillness again. Although boat fishing can be very rewarding, being on the water itself, the fishing pressure constantly increases. These days it’s hard to find places that are silent. Where there’s no one around, it’s just you and the fish. Social media, unfortunately, plays a big key factor in fishing, and to many waters get crowded and quickly become overfished. As much as I love fishing, I didn’t want to be involved in that, so I backed away, searching for different waters that remained untouched. Don’t get me wrong, I absolutely love fishing from the boat, but sometimes you just need to give the fish something different. It still amazes me how brutally effective float tube fishing can be. I wouldn’t say that it’s an easy way of catching fish, but it comes damn near. Fishing from a float tube, in my case the Outcast Super Fat Cat, enables you to get onto the fish, without spooking them. I’ve had encounters with Pike where they followed the fly over my fins and attacked it like there was no tomorrow. Hard strikes breaking the surface right in front of you and direct contact with the fish. Being in the same environment as them, it doesn’t really get much better than this right? As you can see from the picture above, all fish are caught on the fly. Fly-Fishing is probably one of The most effective ways of catching Big Fish Fast! 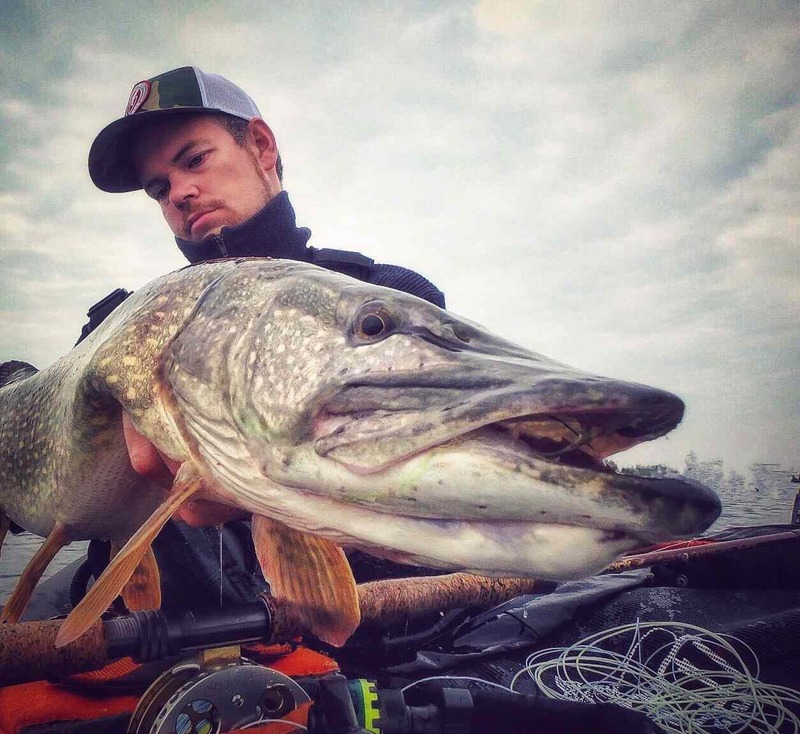 The Bigger Esox that swim our waters are usually easily spooked. They have seen it all, heard the sounds of many engines and trolling motors, but they cannot hear the sound of the tube. In fact, if you carefully move around through the water with your fins, you can get really close. You can get directly into the area’s where the Big ones are lurking on the edges. You can get right into the zone where you need to be, with minimum effort. And probably one of the biggest factors to doing this is that you can fish any body of water, any drop-off the way you want, and get the perfect approach! Before you start fishing any water, it’s a good thing to look at the graph first. 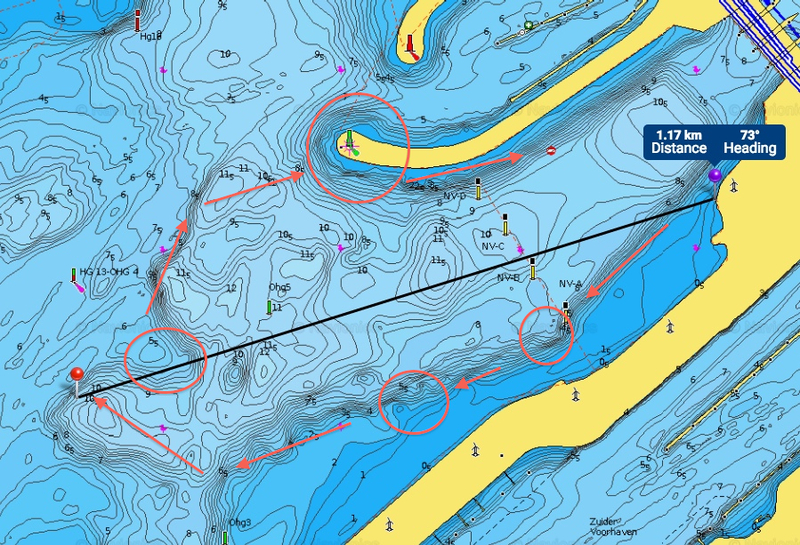 See if there is any Navionics chart available and choose an area that you want to fish. When I go out, I usually fish short sessions from the tube, consisting of a maximum of 3 to 4 hours on the water. The reason why I do this is the following. Effective fishing time. I choose my time on the water wisely. Everybody of water is different. If you got some experience yourself you can recall. There are morning, mid-day and afternoon/evening waters. The best way to found out how every single water works, is to go out there and trial and error. It’s just that, and nothing more. Eventually, you will start to see a pattern, and from there you can take things to another level. Precisely planning of days around weather conditions, and times of the year, and you will run into the reward sooner or later. Usually, the evening before I’m heading out on the water, I check if all my gear is ready, and then start looking onto the map where I’m going to fish. I also look out for a place where I’m going to enter the water. I prefer a place where there’s an easy in and out. The last thing you want is to get in easy at first, but then have a difficulty getting out of the water in the second place. It’s always safety first! What I’m going to do after is determine the depth of the water I’m going to fish. This is all related to the time of year and water temperature. Pike are found at a wide range of different depths throughout the year, and in order to catch fish, it’s essential to take a close notice of this. So after having decided what water depth I’m going to fish, and more importantly what the weather conditions will be for that day regarding the wind, I’m going out. Because in a tube you are not as mobile in terms of boat fishing quick full speed changes hopping from one spot to the other, you need to choose where you fish with great care. Don’t go to any water just to fish. PLAN where you are going to fish, in order to CATCH! I can’t say it enough how important it is to have a plan. Burn it into your mind, and get used to it. It works, 200%. How to approach the water from a float tube? Well, that all depends on what kind of person you are. If you are left or right handed. When going out, I want to make the most of out my time on the water, even though my days are limited. So in order to start fishing, I want to cover as much water as I possibly can. If I would fish a lake, for example, I’d start out on one edge and fish around in a circle. If it would be a channel, and there are 2 drop-offs on each side, I would start on the edge where I could cast left and fish all along, then turn the tube, and fish back the same way to my starting point. A lot of anglers just go out and fish, but actually knowing how to fish, and having pre-decided where you are going to cast your fly can and will make all the difference in the world. The Navionics Chart shown above is a perfect example of how you could plan your trip afloat. 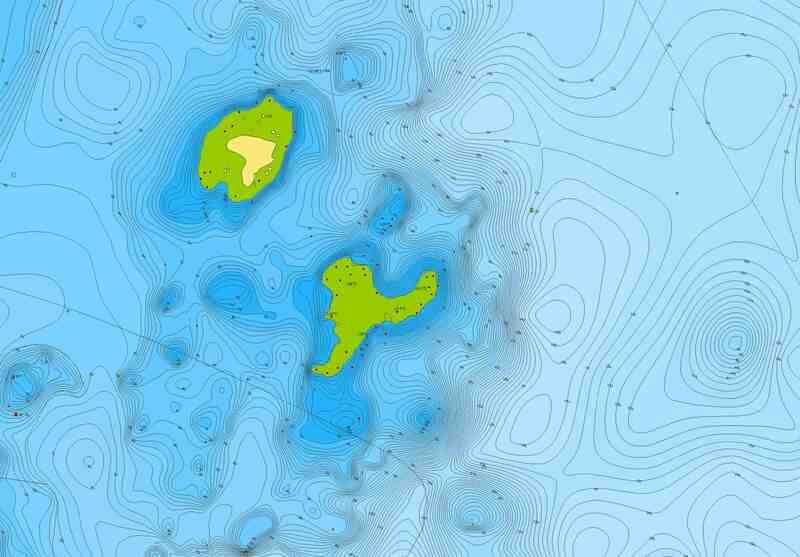 On the bottom, you can clearly see the depth contours (Meters), and where the deeper water meets the shallows. On the other side, there’s an equal edge where you could fish. The deeper water in between is very interesting and can produce fish in either one of the seasons. In Summer I would fish the upper layers of the water, as the cold water period progresses, You can either choose to fish a little bit deeper or simply stay on the edges. A place like this is often very easy to enter from a float tube. The distance which is 1,17km or 0,72 Miles that is highlighted here, is often more than enough to target in one session if you would fish a 3 / 4-hour time span. 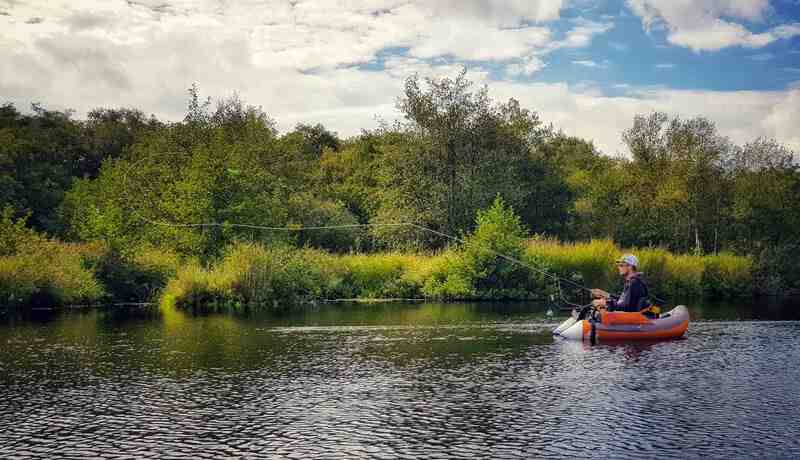 Like mentioned before, fishing out of a float tube is a slow phase, and if you want to cover and target the water as effectively as possible, this is a good thing to keep in mind. Usually, when I’m going out to fish from a float tube, I’m trying to find remote waters that no one has ever fished before, or are hard to access by boat. The picture above is from a water which is very easy to access by boat. It holds different structures, weed flats, shallows, and deep water, and gives you an idea of how to approach any body of water from your inflatable device. Again, it’s all up to you as an angler how you go on about to catch the desired fish, but if you keep these key principles in mind, you can come a long way by just doing some research before you go on your trip out in the open. Every single water out there is different, and each of them needs a different way of fishing them. It may take some time to get to know a new water, but every one of them holds a secret. It’s up to you in finding those secrets and if you do, you could be in for a Big Reward!